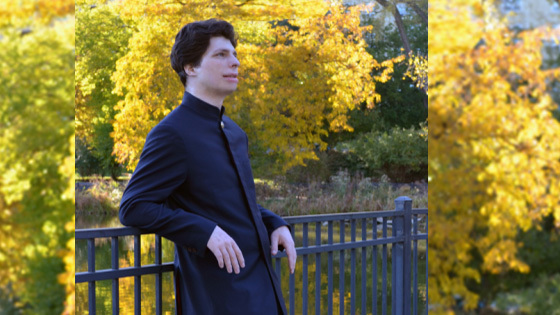 November 27, 2016, 4:59 PM · Here is a pretty good rule of thumb: if Augustin Hadelich is performing in town, go hear him play. But New York-based German/Italian Hadelich did not disappoint, with his energetic performance of Mozart's Violin Concerto No. 5 in A major. Joining the orchestra in the introductory tutti, his solo emerged as a joyous outpouring of sound, from the 1723 "ex-Kiesewetter" Strad he plays (on loan from the Stradivari Society). Hadelich played his own cadenzas, which were in keeping with the delicate yet buoyant nature of the concerto. I noticed that he paid some homage to the commonly-played Joachim cadenzas by leaving in Joachim's rather unique syncopated double-stop passage in the second-movement cadenza. The third-movement cadenza was especially clever in the way it ushered the listener from Mozart's raucous "Turkish" outburst back to the more stately opening theme, passing through some ghostly harmonics on the way, as if sobering up on the way home from the party. The orchestra, under the direction of Krzysztof Urbanski, lagged behind Hadelich's spritely tempos at times and had some moments of strain in the horns. With no intermission (again, "Casual Friday"), more musicians poured onto the stage for Brahms Symphony No. 2 in D major, Op. 73. It was a pleasing performance that left me wanting more. In the after-concert comments, conductor Urbanski described the LA Phil as a "Rolls Royce" of an orchestra - "sometimes I just don't want to be an obstacle." A humble assessment. But I best liked the moments when Urbanski stopped driving like a chauffeur, set his own course, hit the gas and drove like a boss. It happened during the last movement, in a frenetic lick where he was clearly communicating something personal through the musicians. Let these musicians do their thing, and it's an excellent performance; add the risk and it's transcendent. November 28, 2016 at 12:53 PM · Is the ticket price "casual" too? November 28, 2016 at 04:40 PM · I checked for you, Paul; it appears to be identical.